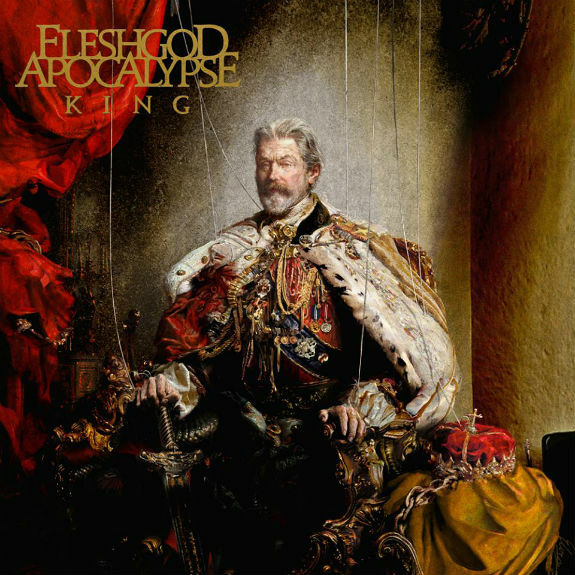 Fleshgod Apocalypse Reveals New Album "King"
The Italian symphonic death metal masters from Fleshgod Apocalypse have revealed the cover artwork to their upcoming album "King." This stunning visualization was created by acclaimed contemporary artist Eliran Kantor. "King" follows previous album "Labyrinth" (reviewed here). Vocalist Tommaso comments: "This work of art is nothing more than the picture of an old world coming to an end. The author, Eliran Kantor, perfectly interpreted the concept behind the album. The King represents the last stand of integrity and justice in a court infested by traitors, villains, perverts, parasites and prostitutes. "In an era that looks more like the Middle Ages than the 21st Century, we felt the necessity to express our indignation for the constant loss of values and our despise for mediocrity and commercial use of superstitions. "The question is, are we sure everything that is 'new' is right? Are we sure we are not losing the perception of what is the real value of things? Perhaps the essence of that King lies inside everyone of us but it's just dimmed by the mist of deceit and (ir)rational superfluity. Perhaps we should all hail the King we have inside." New album "King" is scheduled for release in early 2016 via Nuclear Blast Records. The album was tracked at Kick Recording Studio and 16th Cellar Studio in Rome, and was mixed and mastered by the world-renowned Jens Bogren at Fascination Street Studios in Sweden. 2 Comments on "Fleshgod Apocalypse Reveals New Album"
The King is a puppet?